Spinner dolphins are instantly recognisable due to their incredible multi-rotational aerial spinning behaviour. Spinner dolphins create huge splashes when they land back in the water. Spinner dolphins are champion spinners and well-known as skilled acrobats of the dolphin-world (other dolphins may occasionally spin but only with a couple of revolutions). They’ve been recorded fully spinning along their body length seven times during a single leap. The spinner starts to spin in the water just before emerging head first and leaping up to 3m into the air, spinning continuously before falling back into the sea. Spinner dolphins are very popular with dolphin watchers as their acrobatic behaviour is spectacular. Other names: Spinner; long-beaked dolphin; long-snouted dolphin. IUCN Conservation Status: Data Deficient (globally) on the IUCN Red List of Threatened species. 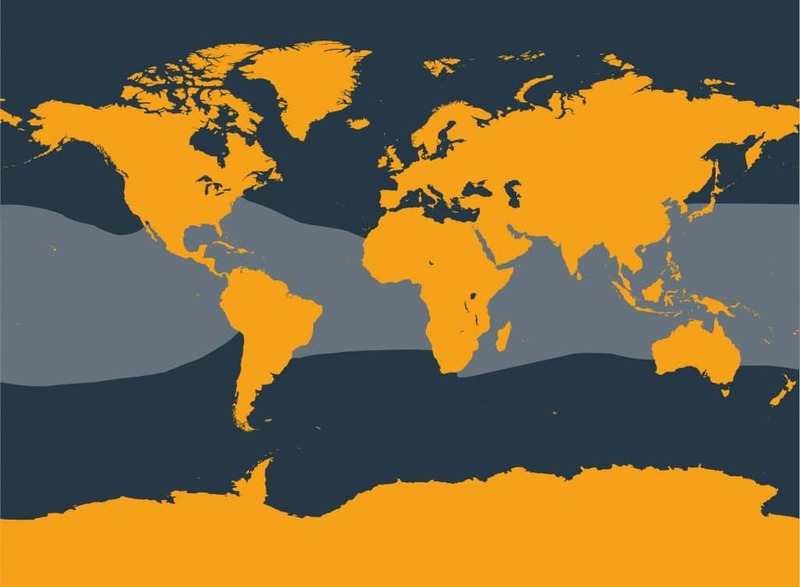 However, the Eastern Tropical Pacific (ETP) eastern spinner dolphin subspecies is categorised as Vulnerable due to severe depletion at the hands of the tuna fishing industry which is responsible for reducing this spinner population to less than half of its original size. 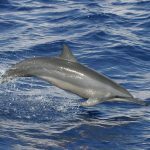 What do spinner dolphins look like? There are four reconised subspecies of spinner dolphins and they vary in appearance and social structure too. The most widespread subspecies is ‘Gray’s’ and has distinctive three-banded colouring; dark grey on the back, a lighter grey on the flanks and a pale belly. 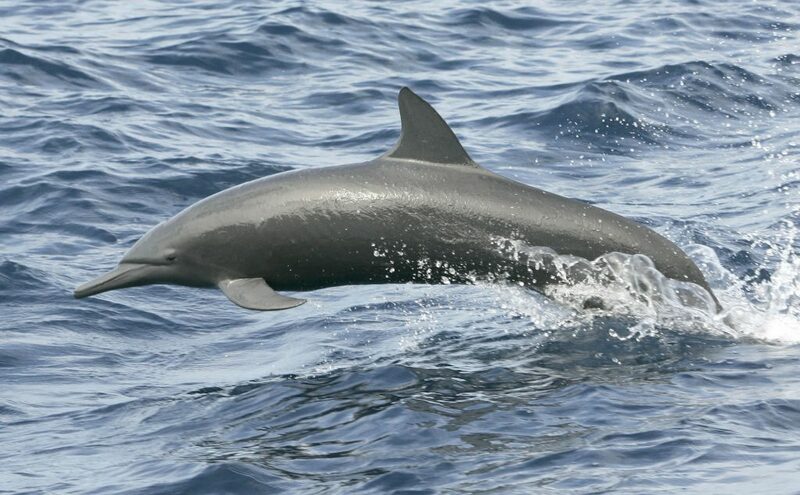 The spinner dolphin subspecies found in the ETP are dark grey-coloured all over. All spinner dolphins have a long, skinny beak, a slender body, small curved flippers with pointed tips, and a tall triangular dorsal fin. Large males in the Eastern Tropical Pacific (ETP) often have a rather odd looking forward-sloping ‘back-to-front’ dorsal fin. 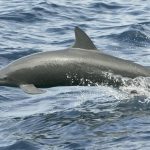 What’s life like for a spinner dolphin? 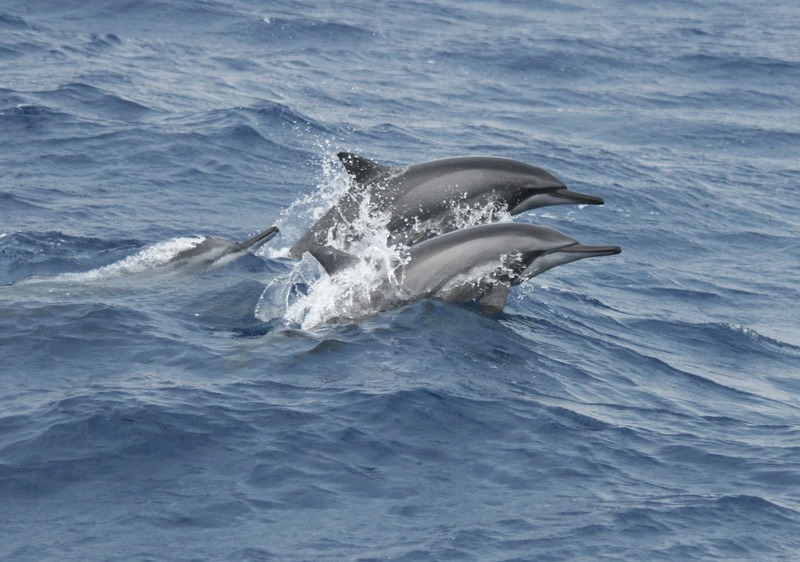 Spinner dolphins generally have a daytime and night time routine. During the day, they rest in shallower, coastal waters. At night they head for deeper waters and hunt. Their favourite spinning time is in the late afternoon and early evening after they have rested and are preparing to head off to hunt. Spinner dolphin pods range in size from fewer than fifty to thousands. Their social structure varies considerably amongst the different forms of spinner dolphins. 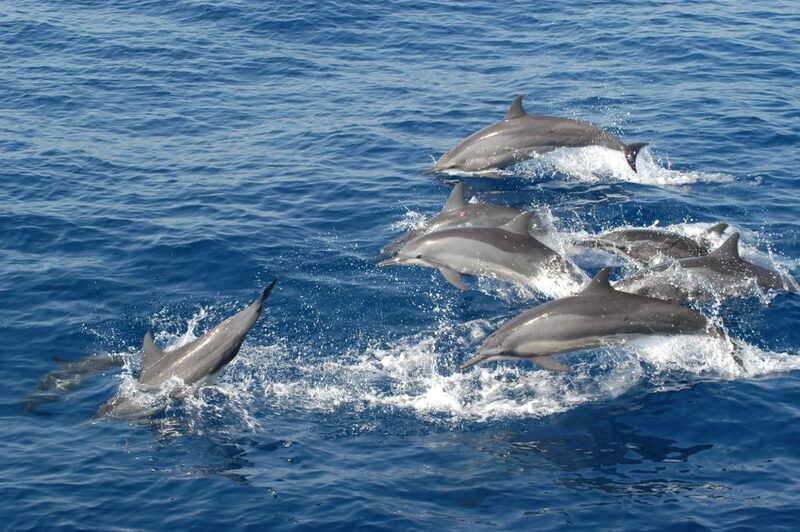 Some populations have fluid arrangements where dolphin groups join up and separate from time to time. Others live in stable pods for many years. 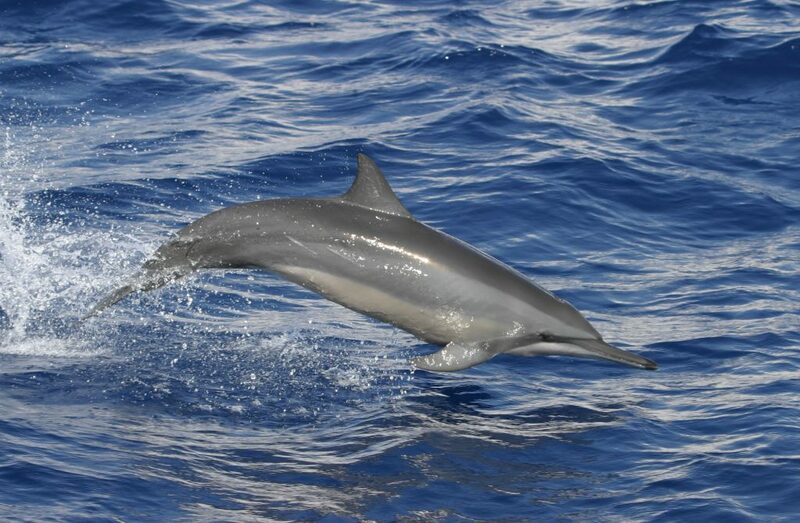 Spinner dolphins have quite a varied diet - they eat small fish, shrimps and squid. Their prey mostly migrates up the water column at night and the dolphins hunt them in mid-water depths. Spinner dolphins live in all tropical and most subtropical waters around the world across the Atlantic, Pacific and Indian oceans. The most common subspecies is called Gray’s spinner and is found throughout the spinner’s tropical and subtropical range except in parts of tropical Asia and Eastern Tropical Pacific (ETP). The eastern spinner occurs in the ETP off the coasts of South and Central America; the Central American spinner is found only in a narrow strip of habitat along the west coast of Central America; and the Dwarf spinner is found only in Southeast Asia and northern Australia. There is also a large population of whitebelly spinner dolphins, which are a hybrid form of Gray’s and eastern spinners and may soon be confirmed as a fifth subspecies. Why do spinner dolphins spin? We don’t know for sure but we think they spin for a number of reasons: Since much spinning occurs following the dolphins’ rest-time, it could be a type of work-out to get their muscles flexed and blood flowing again ready to hunt. Spinning is likely to have a social function too and may be related to courtship activities (showing off!). Spinning may also be a way of removing parasites such as suckerfish from their bodies. Once a dolphin starts to spin, others will join in and so there is clearly a social, communicative, and likely playful element to spinning. Spinner dolphins are one of the species decimated by nylon seine net tuna fisheries in the Eastern Tropical Pacific (ETP). Spinner dolphins frequently travel together with large tuna schools and so fishermen chase dolphin pods, knowing they’ll find tuna swimming below the pod. The tuna boats set their nets around the dolphin pods catching both dolphins and tuna. Often the trapped dolphins suffocate and die. Between 1959 and 1972 an estimated 1.3 million spinner dolphins died at the hands of the tuna industry. 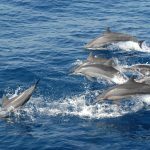 Wildlife campaigners and public pressure have forced the tuna industry to reform their methods and allow the dolphins a chance to escape the nets before the tuna nets are hauled in. Even so, thousands of dolphins are still dying every year and the spinner dolphin population has failed to recover. Ongoing repeated chasing and capturing of the dolphins causes significant stress, so those released are unable to reproduce at normal rates. Entanglement in other fishing nets and equipment - Other threats include bycatch in other fisheries throughout their range including driftnets and gillnets. Hunting In some cases bycatch has led to large amounts of deliberate hunting for use as bait in shark fisheries or for human consumption in several regions. Spinner dolphins are hunted in the Solomon Islands, mainly for their teeth, which are used in the traditional economy. Harassment by dolphin-watching and swim-with-dolphins boats is a threat in several locations. Spinner dolphin groups have become tourist attractions, especially in areas where the dolphins predictably rest during the day. Constant disturbance can disrupt sleep patterns and behaviour, which can impact on their ability to stay healthy and reproduce normally.